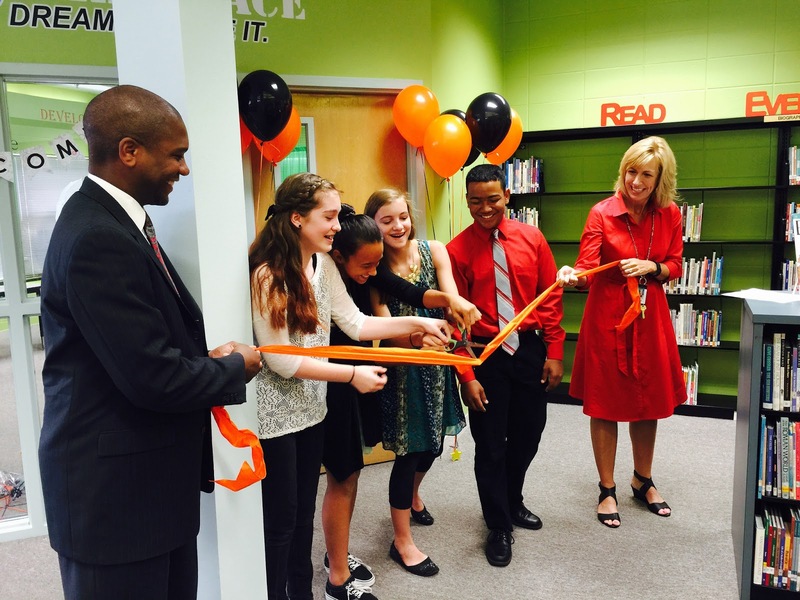 Thursday, September 3, 2015 Sandy Brand, Librarian at Liberty Middle School, held a ribbon cutting ceremony for the new library MakerSpace. Creating a MakerSpace for the Liberty Middle School library has been a dream of Sandy's since she came to Liberty a year ago. She had worked hard all last year and over the summer to make this dream a reality. Students started the school year a month ago and have been chattering about what could possibly be behind the big area covered with a black curtain in the library. With the ribbon cutting ceremony students, teachers, parents and community members were finally able to see all of Ms. Brand's hard work and the amazing array of items students will now be able to use to create, discover, explore and learn. In attendance at the ribbon cutting were Madison City central office personnel, PTSO members, students, parents, Mayor Troy Trulock, and the local news media. Students are certainly in for an exciting school year in the library at Liberty Middle School!